Sorry for my lack of posts in the past couple days folks, but I've been really busy! Every year around this time, for some reason, times starts to fly by. It seems like yesterday I was wondering around Soho and waiting for new years to make its way and now, it's February already and I have an never-ending list of To-Do's - which is always a good excuse to get over-priced notepads to jot down things down and hang them on the fridge (where else would I never forget to look? ), although, that's quite besides the point! Being uber busy isn't a bad thing really, especially since I've always been the type to be most productive the more there is to be done.. it's a sort of adrenaline thing, really. All to say, that I have been cooking, and haven't forgotten you, just trying to manage my time! This buttermilk chicken was a weekend treat, well worth the time it took to brine the chicken. Thank you Thomas Keller! The chicken was moist and flaky and the fried coating perfectly seasoned and crisp. I'm definitely no expert on fried chicken (not exactly a Parisian's girl Saturday night ritual!) but it was delicious. We served it with a fresh spinach salad with roasted almonds, and drizzled honey and lemon over the fried deliciousness. It was quite the treat! Let me say a few words about Thomas Keller's Ad Hoc. First off it's really, really a beautiful book. It's one of those coffee table books you can pick up at any time of the day and read just to learn more about the cooking process. The text is beautifully written and will echo in the minds of everyone who has a true passion about cooking. The explanations are clear and honest and meant to make us all better cooks, at home. A lot of what Keller writes is a shortened version of what I learned at culinary school, which makes me smile because it reminds me of the first time I stepped into a professional kitchen, and how utterly clueless, excited and nervous I was. The recipes are really written for the home cook to improve, learn from his/her mistakes and have fun in the kitchen. My only problem is that the book is quite hefty and not that easy to have next to you in the kitchen especially if you like keeping books out of the kitchen war zone! Brine: Bring all brine ingredients to a boil in large pot (except the chicken). Boil for 1 minute, stirring to dissolve salt. Cool completely. Chill the brine until cold, about 2 hours. Rinse chicken; add to brine, pressing to submerge. Chill at least 12 hours and up to 24 hours. Drain chicken and pat dry, removing any herbs or spices sticking to the skin. Cut each chicken into 8 pieces and lay on parchment-lined baking sheet for about 2 hours or until completely dry. Make sure the chicken is completely dry before frying or the water will spatter in the oil and it can be very dangerous! Frying: Line 2 large baking sheets with parchment paper. Mix first 6 ingredients and 4 teaspoons coarse salt in large bowl. Place buttermilk in another large bowl. Dip each chicken piece in flour mixture to coat; shake off excess. Dip pieces in buttermilk, coating completely, then dip into flour mixture again, coating thickly (do not shake off excess). Place chicken on prepared sheets. Pour peanut oil into heavy large pot. Attach deep-free thermometer to side of pot and heat oil over medium-high heat to 320 degrees Fahrenheit and 330 degrees Fahrenheit. Working in batches of 4 pieces at a time, add leg and thigh pieces to oil (use splatter screen to protect yourself from hot oil). Adjust heat as needed to maintain temperature. Fry until cooked through and skin is deep golden brown, turning once using wooden spoons, about 10-13 minutes. Using wooden spoons, transfer chicken to paper towels to drain. Sprinkle with course salt. Transfer chicken to a serving platter. Serve with a good drizzle of honey, a squeeze of lemon and fried rosemary. Enjoy! Oh, well, sweet baby Jesus. That! Chicken! Would gladly mow down a few pieces with my coffee right this second. Lovely photos. Funny you mentioned the heft of Ad Hoc--I was wondering that very thing while checking it out at the bookstore the other day! I'm craving me some fried chicken lately...along with some buttermilk biscuits & gravy! Your chicken looks delish! I can't wait until I own that cookbook! Until that day, I'll just drool over this chicken. It sounds perfect, and your photo is just stunning. hmm, frying chicken kind of makes me nervous. if i was going to try it at home, i think i'd follow your lead and go with the ad hoc recipe. Wow...looks finger-licking good. I love it. ha ha over-priced notepads! so guilty of that one. I adore my fried chicken with lots of honey and salt. never tried the lemon though, but I am game! I don't know what I am drooling over more -- the recipe or your gorgeous picture. Mouthwatering!! Reminds me of KFC chicken! Looks so good! Oh, I know this is good chicken because you brined the meat. I don't eat fried chicken very often, but whenever I do, I will use this recipe. Thanks for posting! A friend of mine just got the book and made the chicken and was drooling on the phone telling me about it... honey drizzle too??? OMG! I have to get this book. I too am an expensive notebook buyer. And then I buy some more because they seem so sullied with a few pages written in....so I have lots of expensive notebooks with a couple of used pages, lying around. Sigh. Love the presentation! Looks so yummy! 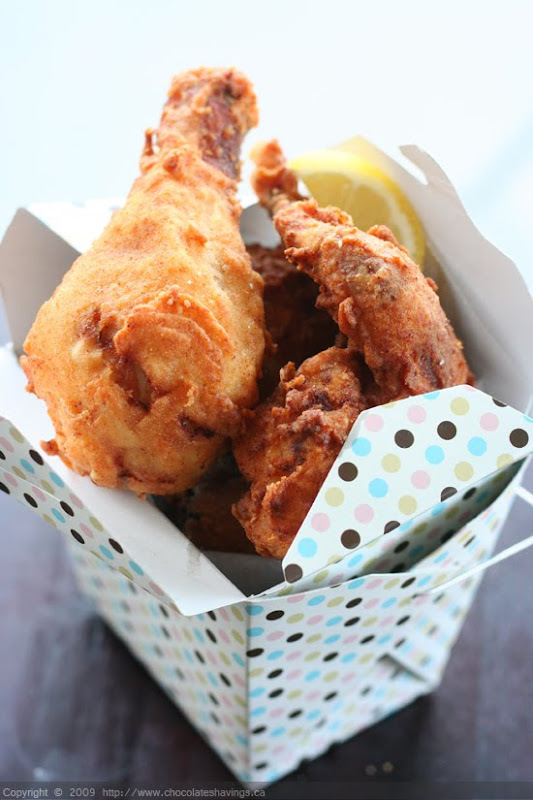 I cannot remember the last time I had fried chicken, but oh this looks so wonderful. I bet it is perfectly crispy and well worth the fry! Great photo! What a gorgeous photo of the chicken. I can only imagine how terrific this fried chicken Thomas Keller style would be. Ahhhh, fried chicken. Sigh with longing. I have heard great things about this recipe. And now I'm craving fried chicken! Your chicken looks incredible! I can't wait to get cooking from Ad Hoc! Ooh... the chicken came out great! I can't wait to try some of the recipes from this book. I think I'm making cupcakes first! Love the packaging used in the photo. The chicken looks divine! This is something that I would love to cook everyday! It really looks so delicious!